I am excited to show a couple of photos of the props from our kindergarten version of Eric Carle's, The Very Hungry Caterpillar. Our school puts on a kindergarten graduation ceremony at the end of the year. Since I was the only kindergarten teacher, I got to choose the theme! Last year, we did an adorable reading of Leo Lionni's, Swimmy. 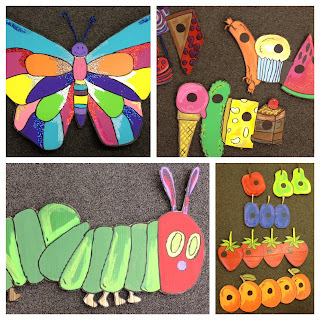 This year, I decided to do a reading of The Very Hungry Caterpillar. Not all of the students can be shown in photos on the internet, so I can't post actual pictures from the graduation, but I can show pictures of the beautiful props that my friend Kristen made! I typed out the words from the story and divided it among 8 students to be our readers. Other students had the part of carrying a prop across the stage as the story was being read. In between some of the readings, we sang a couple of songs about caterpillars and butterflies! Here are the props from the play! Little egg on a leaf. All of the junk food. The photos don't show how big the props are. The butterfly is as big as a 5 year old. Each prop is really big, so the kids looked adorable trying to carry it across stage. :) To make them, we used our projector to shine the book's illustrations onto the board where we traced them. My co-worker, Kristen is so talented when it comes to anything creative. She was the mastermind behind the painting, and of course, GLITTER! 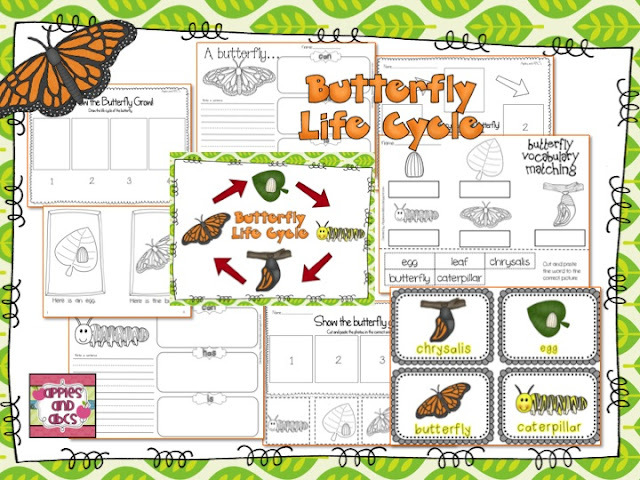 Before our play, I was able to use my Butterfly Life Cycle Unit to teach about the life cycle. Check it out in my TpT Store! She made a beautiful quilt of The Very Hungry Caterpillar! I almost died because it was so thoughtful and so special to this class! She printed out all of the words to the story on special fabric that you can print on! You certainly are loved! Your props were truly works of art. What a fun day! Wow! The quilt is great, what a thoughtful gift! Oh, what a darling set of props and such a wonderful idea! I am sure the parents and children loved it. Your quilt is beautiful, Thanks for sharing. That quilt is absolutely gorgeous!... for an absolutely amazing teacher! Happy summer!!! Those props are amazing and what a special quilt!! That quilt is amazing! What a thoughtful gift!